The inimitability of India is reflected in its food, which is not only easy to prepare, but also appetising. This is especially true for cluster beans, called Cyamopsis tetragonoloba in scientific parlance. 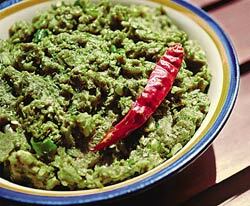 They are popularly known as guar kil phalli in many northern states of India. They are called govar in Gujarat, kothavara in Tamil Nadu, jhar sim in West Bengal and achinga in Kerala. Cluster beans are particularly very popular in Rajasthan, as the plant is drought-tolerant. It looks more like a leafy weed than a bean-producing vine that has been busy bearing fruit all summer. The beans are most desirable for cooking when they are tender. They taste bitter when chewed raw, but become extremely tasty when cooked with spices. The plant can also be used as cattle feed or green manure. The beans have a large endosperm that contains galactomannan gum, which forms a gel in water. This is commonly known as guar gum and it is used for manufacturing dairy products like ice cream; it acts as a stabiliser in cheese and cold-meat processing. It can also be used for industrial applications of the paper and textile industry, ore flotation or the manufacturing of explosives. The current demand for guar gum outstrips supply and hence cluster bean cultivation is being introduced in new areas. Presently, about 40 per cent of the world production of guar gum comes from India.